Feb. 8, 2008--Ted Gregory, who starred on the football field for the University of Delaware and later went on to become the program's first African-American coach, died at the age of 58 in New Castle, Del., on Feb. 5. Born in Welch, W.V., in 1949, Mr. Gregory was a graduate of De La Warr High School in Wilmington, the University of Delaware and West Chester University. He earned his degree in physical education from Delaware in 1971 and later earned his master's degree in education administration. While at Delaware, he was a standout defensive end, earning three letters from 1968-70 while playing for head coach Tubby Raymond. He led the team to a three-year record of 26-7, which included winning the Middle Atlantic Conference titles in 1968 and 1969, the Lambert Cup Eastern Trophy in 1968, 1969 and 1970, and the Boardwalk Bowl all three seasons. Mr. Gregory also competed for the UD track and field team and placed third in the shot put at the 1970 Middle Atlantic Conference championships. 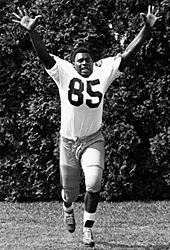 He was drafted in the eighth round by the New York Giants in the 1971 National Football League draft and also had a tryout with the Cincinnati Bengals before the 1972 season. He joined the Blue Hen football staff in 1972, becoming the first African-American hired to the staff, and served as an offensive line and defensive ends coach until the 1977 season. During his tenure, Delaware teams won the 1972 small college national title, advanced to the NCAA Division I title game in 1974, advanced to the NCAA quarterfinals in 1976, and won the Lambert Cup Trophy twice. A service will be held at 5:30 p.m., Saturday, Feb. 9, at The House of Wright Mortuary, 208 E. 35th Street, Wilmington, Del. Viewing will be held from 3:30 until 5:30 p.m.